On February 7th and 8th the team from BOS Nyaru Menteng will be releasing 20 more orangutans back into the Bukit Batikap Conservation Forest, where they will being the next phase of their life as wild orangutans! View more on the BOS Foundation webpage! Please make a contribution to our BOS Nyaru Menteng Orangutan Release Fund. And now... Let's meet the candidates! We'll start off with some familiar faces from the Animal Planet series Orangutan Island! Hamlet was confiscated by BKSDA Central Kalimantan from a resident of Palangka Raya. He was then sent to Nyaru Menteng for rehabilitation on November 3, 2000 when he was 3 years old and weighed 9 kilograms. In Nyaru Menteng, Hamlet went through all the rehabilitation process from Forest School, up until 2006 when he was placed on Palas Island with other orangutans. Living in Palas Island, along with Komo and Daisy, Hamlet starred in a documentary entitled “Orangutan Island”. After 14 years of living in Nyaru Menteng, Hamlet has learnt so much about how to survive in the wild. He is now 17 years old and weighs 65 kilograms. This handsome, active and adventurous orangutan will shortly be exploring his true home in the forest of Bukit Batikap. This male orangutan was confiscated by BKSDA from a resident of Muara Teweh Village, Barito Utara Regency, who illegally kept him as pet on August 5, 2002. Mercury was 1.5 years old and weighed 4.4 kilograms at the time. He was dehydrated, and was suffering from fever and accute diarrhea. Mercury received intensive care from the Medical Team and after two months of fighting the illnesses he had contracted whilst in captivity, Mercury was declared healthy and cleared to join Forest School. This short-haired orangutan with round eyes graduated from Forest School in 2007, and lived on Palas Island going through the whole pre-release process. On Palas Island, Mercury was adventurous, curious, vigilant, and competitive to obtain food. He was also a friendly orangutan. Troll and Jupiter were his best friends on Palas Island. In the documentary “Orangutan Island”, Mercury was known as a member of “The Bandit Boys”. Now, at 13 years old and weighing 48 kilograms, Mercury is ready to live independently in his new home in Bukit Batikap Conservation Forest. Confiscated by BKSDA from a resident of Palangka Raya on April 13, 2002, Reno was a 2.5 year-old orangutan weighing 7 kilograms. This young male orangutan arrived in Nyaru Menteng without his mother. After being cared for in quarantine, Reno entered Forest School to regain his natural behavior and learn new forest skills. Reno graduated from Forest School in 2007, and went onto join the final pre-release process on Palas Island. 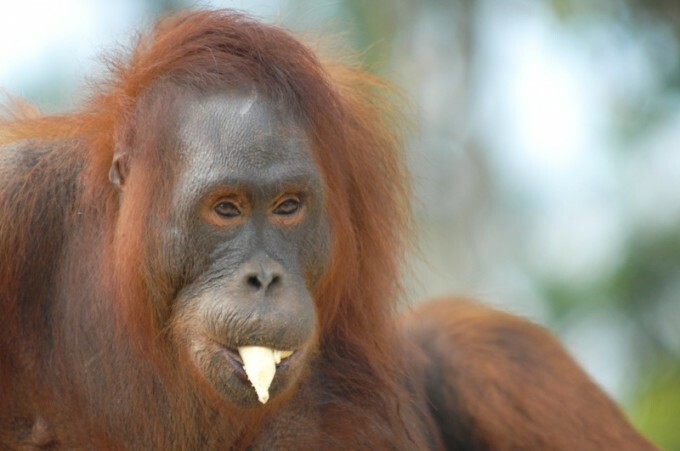 Reno was an active explorer of Palas Island and was respected by other male orangutans. 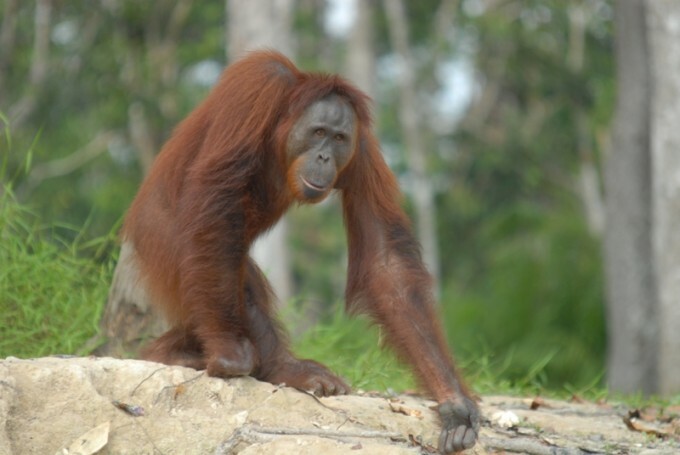 He also attracted a lot of female orangutans on the island, one of them being Manisha. 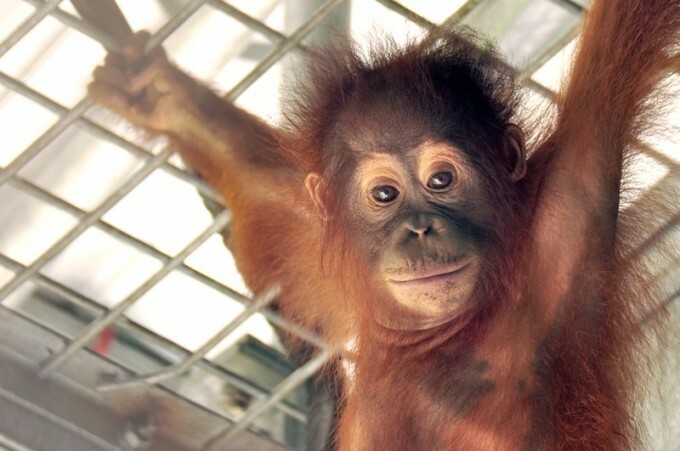 Reno, too, was one of the stars of the documentary “Orangutan Island”. 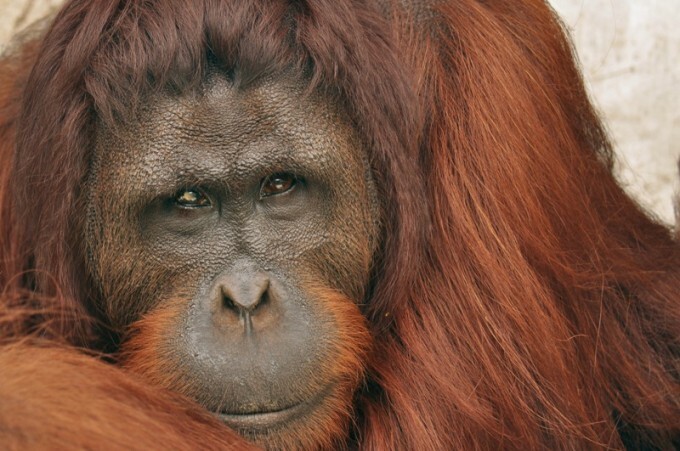 Now Reno is a 14 year-old orangutan weighing 54 kilograms. 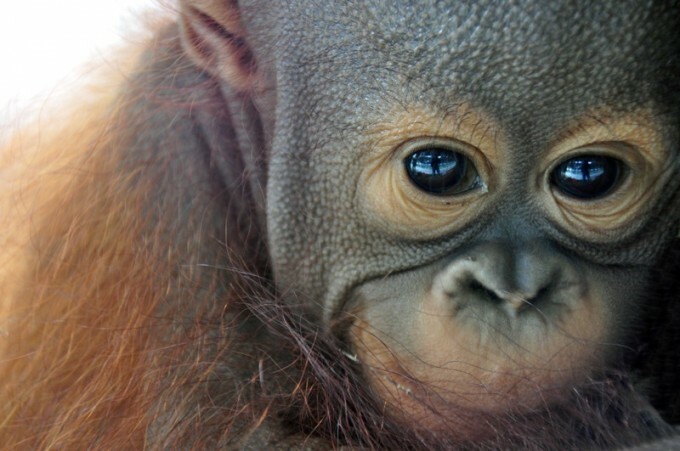 Little Reno has grown into a male adult orangutan with cheekpads and dominant behavior. Reno will be able to explore his true home in Bukit Batikap Conservation Forest in no time and be together with Manisha. Confiscated from a resident of Palangkaraya, Manisha arrived at Nyaru Menteng on August 12, 2000. She was four years old and weighed only 14.5 kg. The motherless young was also very weak. Manisha started her life on Palas Island in 2007. She loves exploring the island and is very skilled in looking for wild natural foods. Her favourite food is wood bark and termites. When it’s dry season on the island, Manisha also loves to play in the mud. Living on Palas Island, with Reno, a male orangutan, Manisha starred in a documentary entitled “Orangutan Island”. Now the beautiful Manisha is 17 years old and weighs 52 kg. The female with a dark face and sharp stare soon will put her independence into practice in the real forest of Bukit Batikap. Jane was confiscated from a resident of Palangka Raya by the Central Kalimantan Conservation and Natural Resources Authority (BKSDA) on November 9, 1999 when she was 4 years old and weighed 13.5 kgs. Jane was a shy orangutan who was very dependent on her babysitter. She then joined Forest School to gain the skills would need to survive in the wild. On June,14 2012, Jane finished Forest School and was directly moved onto Kaja Island. She became very adventurous and independent. 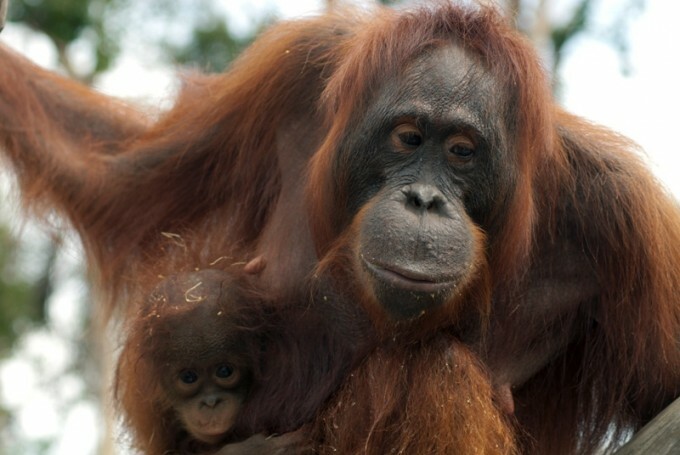 During her life in Nyaru Menteng, Jane has given birth to two baby boys. Her first son is Jojang who was born on Kaja Island on June 1, 2007 and her youngest son is Jiro, who was born in the Pre-Release Quarantine Area on June 17, 2013. 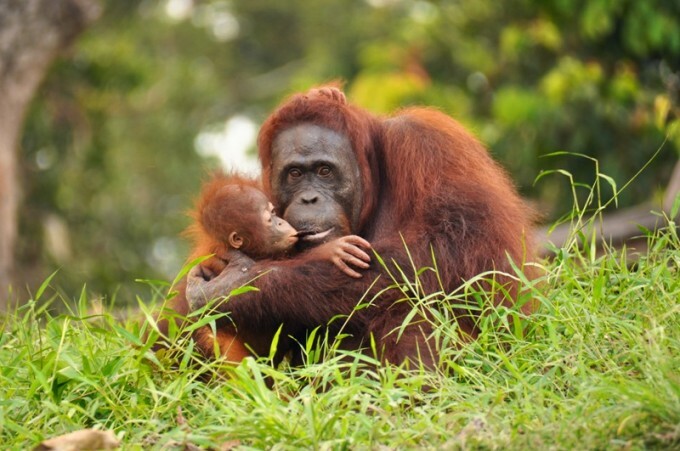 We had originally planned for Jane and Jojang to be released to the forest in February 2013, however on discovery that Jane was in fact pregnant at that time, we delayed their return to the forest until Jane had safely delivered her baby and the infant was strong enough to accompany his mother to the forest. Jiro has been very healthy since birth and is now seven months old, weighing 2.5 kgs. Jane, his mother, is also in fine health at 19 years old and weighing 40.5 kgs. Jiro will be going home with his mother and big brother. Jojang is Jane’s first son who was born on Kaja Island on June 1, 2007. Her mother has showered him with much love and also taught him how to survive life in the wild. Jojang with his thick hair, already acts like a wild orangutan. He doesn’t like to be surrounded by people and will kiss-squeak towards them. Jojang very adept at living on the pre-release island and especially good in making nests. He is still moves around close to his mothers though. Now that he is seven years old and weighs 16 kgs, he is ready to go back to his home, the Bukit Batikap Conservation Forest, together with his mother and baby brother. A female orangutan named Kitty was confiscated by BKSDA from a resident of Palangka Raya on August 12, 2000. She was 4 years old and weighed 12 kilograms when she first arrived at Nyaru Menteng. On Palas Island, Kitty was a soft orangutan and easily got along with other orangutans. Kitty was also independent and adventurous. On August 6, 2011, this dark-faced female orangutan gave birth to a female baby. The baby was named Kate and is now 3 years old, weighing 5 kilograms. After 14 years of living in Nyaru Menteng, Kitty is now 18 years old and weighs 40 kilograms. This short, dark brown-haired orangutan will be living in Bukit Batikap Conservation Forest along with her baby. Zena was five years old and weighed 24 kgs when she was confiscated by the Central Kalimantan Conservation and Natural Resources Authority (BKSDA) on September 28, 2002. Zena had a high dependence on humans because she had been kept illegally as a pet for too long meaning that she had to join Forest School to restore her natural abilities and behaviours. She was very introvert and prefers solitude. But even so, this young female orangutan is an avid explorer and very good at climbing. When she lived on Hampapak Island, Zena liked to sit alone up in the towering trees. She is also good at finding natural foods, be it fruits or young leaves. Zena gave birth to William, her first son, on February 3, 2010 on Hampapak Island. Zena loves her son and has been able to teach him the basic survival skills that he will need in the wild, of course because she has been learning all of those skills herself in Nyaru Menteng for 12 years. Now, this pretty brownish-haired orangutan is 17 years old and weighs 43 kgs. While her baby boy, William is now just four years old and weighs 8 kgs. 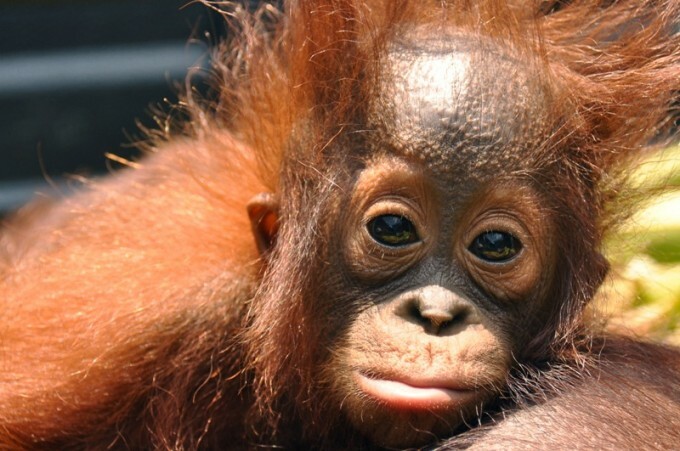 Shortly, William and his mother will go back to their truest home, Bukit Batikap Conservation Forest. Dita was confiscated by the Central Kalimantan Conservation and Natural Resources Authority (BKSDA) from a resident in Semarang, Central Java on November 8, 2012. She arrived in Nyaru Menteng when she was four years old and weighed 17 kgs. 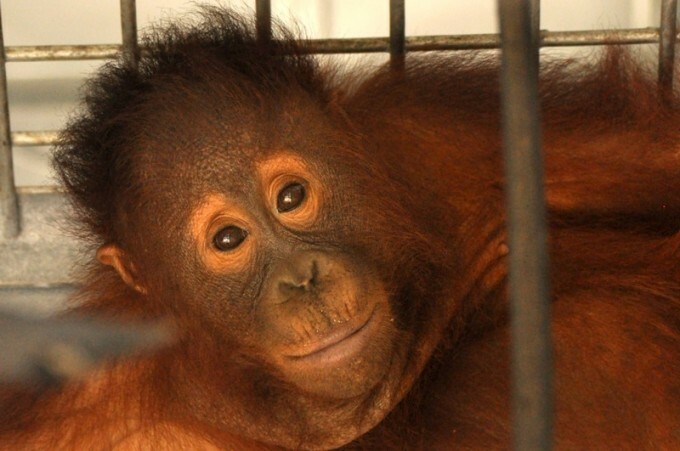 Dita started her rehabilitation process in Nyaru Menteng by attending Forest School. 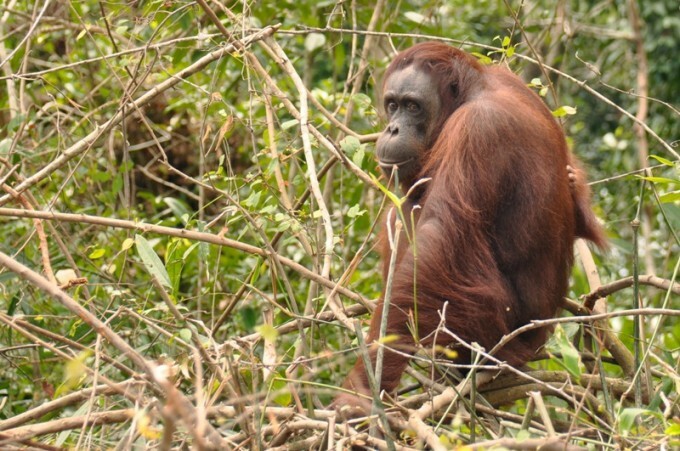 Graduating from Forest School, Dita moved onto our Pre-Release Island, Hampapak. She is one active orangutan who likes to explore and is very friendly. On January 23, 2012, Dita gave birth to her first daughter, named Halt. Halt is now two years old and weighs 7 kgs. She is always kept tucked safely in her mum’s arms. Dita is now 16 years old and weighs 45 kgs. Dita and her little princess, Halt, will soon be back where they belong in natural habitat, their truest home, Bukit Batikap Conservation Forest. Judy was confiscated by the Central Kalimantan Conservation and Natural Resources Authority (BKSDA) from a resident in Kapuas Regency on May 7, 2002. She was only 6 years old back then. When she lived on Hampapak Island, she made friends with many orangutans although she herself was a shy orangutan. 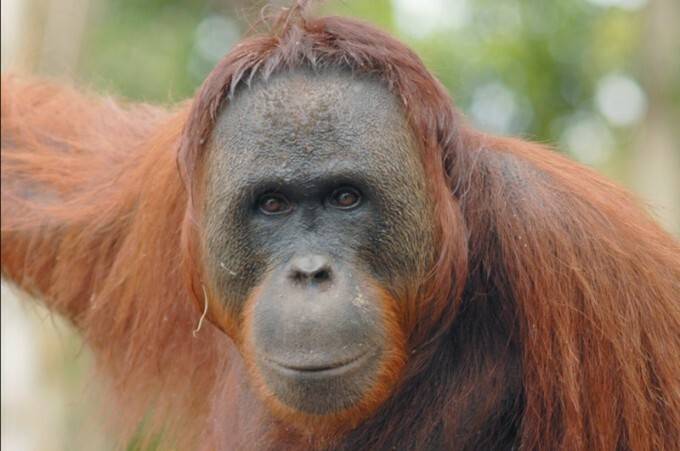 Judy is an orangutan with short hair and dark face. She loves to roam the forest. On October 2, 2012, Judy gave birth to her first baby boy named Son. Judy loves Son very much. She has already began to teach Son the basic survival skills to live in the wild, which she herself has already mastered. Now, this 58 kg orangutan is 18 years old, while Son, her baby is two years old and weighs 4 kgs. Judy will soon be back in her true home and be able to raise her baby in the real forest. 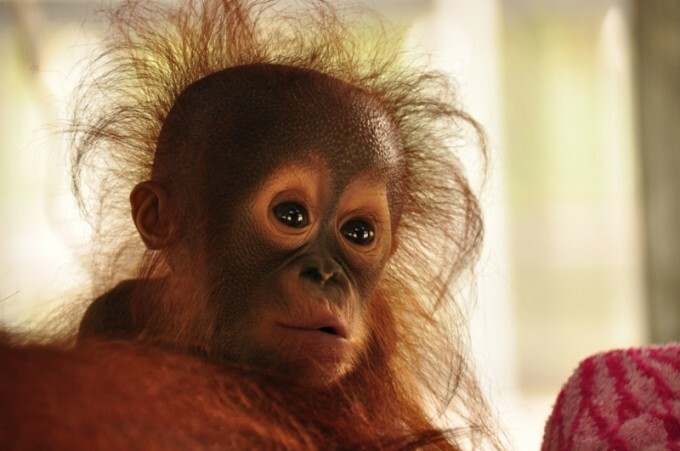 Jupiter was only a year old, and weighed 4.4 kilograms when she was confiscated from a resident of Sampit by BKSDA. This poor female orangutan arrived in Nyaru Menteng on 13 March 2001, without her mother. 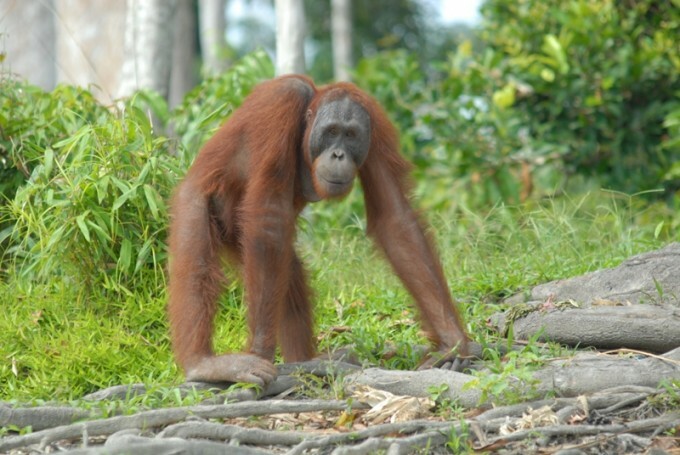 Having gone through Forest School, Jupiter has been living on Palas Island since December 11, 2006. 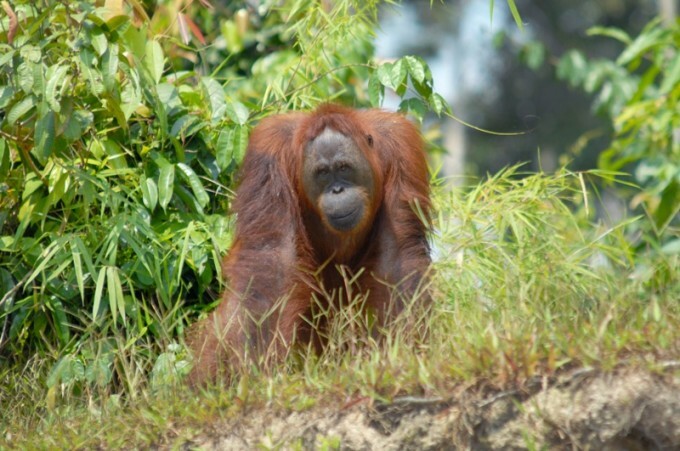 Whilst on the pre-release island, Jupiter was an active orangutan and reliable adventurer. This narrow-eyed female orangutan rarely mingled with other orangutans. 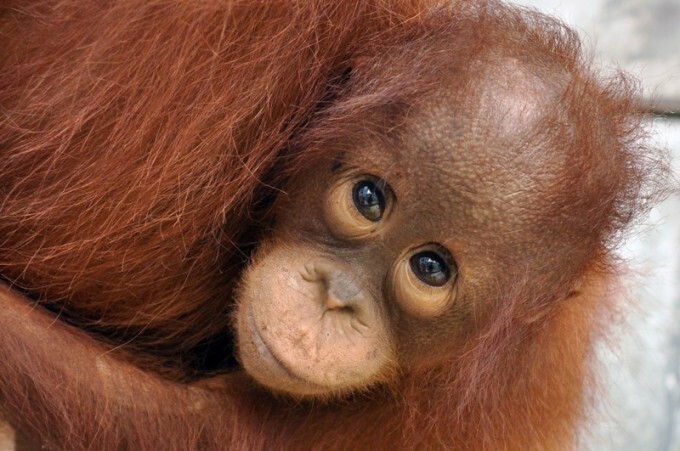 Despite that, she was one of the stars of documentary “Orangutan Island” along with Hamlet, Mercury, Manisha, and Reno. On April 29, 2013, Jupiter had her first female baby named Julfa. Jupiter is now 14 years old and weighs 42 kilograms, while Julfa is now 9 months and weighs 4 kilograms. From her experience of 13 years living in Nyaru Menteng, Jupiter will teach her daughter, Julfa how to be a true wild orangutan in their new home, Bukit Batikap Conservation Forest. Joys was confiscated by BKSDA from a resident of Banjarmasin, South Kalimantan, on November 10, 2003. 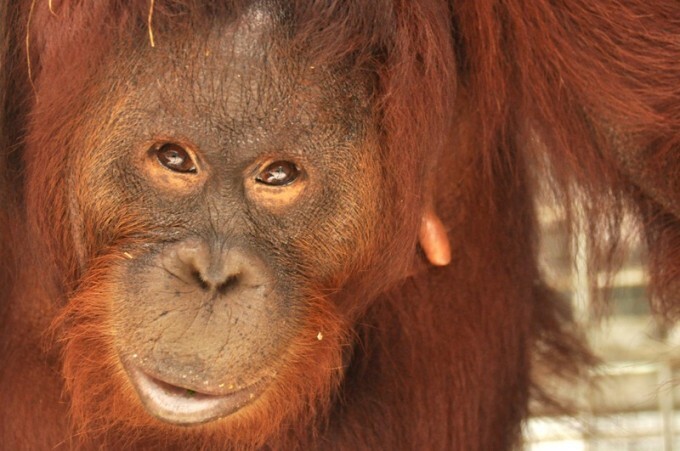 When she arrived at Nyaru Menteng, she was a 33 kilogram, 8 year-old orangutan. There was a scar on her neck caused by the chains used to tie her when she was kept illegally as pet. Joys spent quite a long time on Hampapak Island and has learnt so much about how to survive in the forest whilst on the pre-release island. This long brown-haired female is very friendly with other orangutans. Joys is now 19 years old and weighs 53 kilograms. She has spent ten years in Nyaru Menteng and successfully graduated from Forest School. Now it is time for Joys to live her life as a true wild orangutan in her true habitat, in the forest of Bukit Batikap. 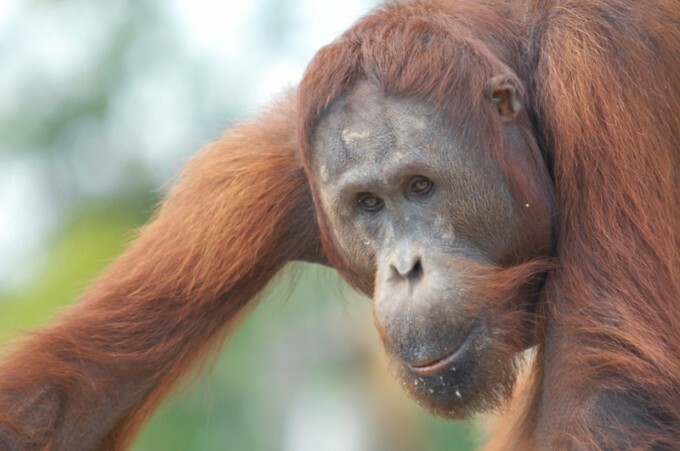 Noor is the very first orangutan to arrive in Nyaru Menteng when it was founded in 1999. This female orangutan arrived on August 23, 1999, confiscated by the Central Kalimantan Conservation and Natural Resources Authority (BKSDA) from a resident of Palangkaraya. Noor was only two years old and weighed 6 kgs at that time. After passing through the quarantine and Nursery Group two years later, this active little orangutan joined the Forest School. 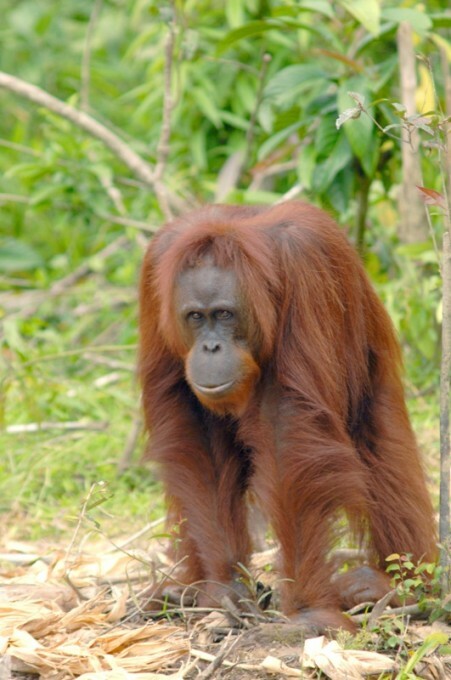 She graduated from Forest School in 2003, and was moved onto our Pre-Release Island, Palas. Noor, who has round eyes with black skin loves to play with other orangutans. Her close friends are Miss Owen and Praya. Noor is very good at climbing and also at finding wild fruits and termites. She also is not afraid of water like other orangutans. Noor is often seen bathing in River Rungan, submerging herself right up to her neck and catching fruits that are sometimes carried by the current of the river. Now she is 17 years old and weighs 68 kgs. She doesn’t like to be surrounded by people and will kiss-squeak to show her dissatisfaction. 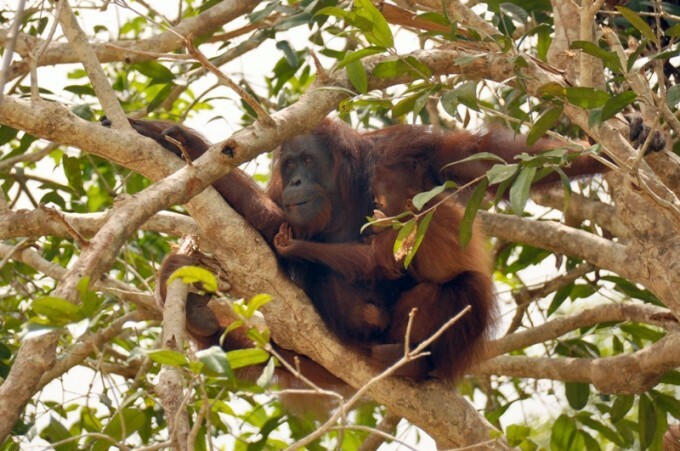 Being so independent and wild now enables her to be returned back to her true home, Bukit Batikap Conservation Forest. Sarita arrived in Nyaru Menteng on May 31, 2001. She was six years old when confiscated from a resident of Jakarta and was only 13.5 kgs back then. She lived in Palas Island after finishing her time in Forest School. On Palas Island, she became a clever explorer. Despite her petite body, Sarita is very well known because she is very agile and vigilant. Sarita has special physical characteristic, which are small bumps on her forehead. She is now 19 years old and weighs 36 kgs. During her 13 years of living in Nyaru Menteng, Sarita has learnt a lot of survival skills to be able to live in the real forest. In a few days time, she should be able to prove her independence and capabilities as a true wild orangutan who will live in the Bukit Batikap Conservation Forest.